Ninjutsu is an ideal way to gain fitness, confidence and new skills and includes many outdoor activities and pursuits. We encourage both male and female practioners of all ages. 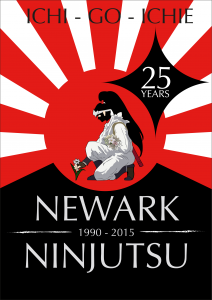 Visit the Ninjutsu menu above to find out more about the art. Male practitioners will involve themselves (as will the females and children) and will be taught and assessed in all aspects of Taijutsu (body combat), weapons training and other peripheral elements of traditional and modern Ninjutsu. You will be expected to undergo regular training and attend some seminars. Female practitioners of Ninjutsu are traditionally referred to as Kunoichi, which translates to “deadly flower”. Our female members train alongside their male counterparts in all aspects of their Taijutsu and weapons training and peripheral skills. The junior practitioners are known has Hattori after the famous Hanzo Hattori who was retained by the Shogun Iyeasu Tokugawa. Our Hattoris can begin their training from 9 years old and will stay a junior till somewhere between 14 and 16. The transition to senior training will depend on a number of factors. They will undergo similar training to their senior practitioners. Juniors only train on a Sunday morning.